Mainland-born film director Fan Lixin will show his award-winning documentary Last Train Home (歸途列車) on Monday, March 29 at 12.30pm at HKU’s Main Building Room 103. The film shows one of the world’s largest annual human migrations: the return home of millions of families for Chinese New Year. It follows the story of the Zhang family, who, in a snowstorm in 2008, found themselves stuck during this return as the weather paralysed the rail network. Changhua and Suqin Zhang have left their home in the country, and taken jobs in the city, to pay for their children to have a better future. The children’s grandmother is looking after them, and the couple is desperate to get home in time to see them. This documentary film won best feature length documentary at the Amsterdam International Documentary Film Festival in November 2009 and was nominated for the Grand Jury Prize at Sundance this year. It looks at the effect of Chinese industrialisation on this one ordinary family. “As the film progresses the physical distance between the family members becomes more and more clearly a metaphor for both the social changes in China as a whole – a family-oriented culture broken into individual chunks by the pressures of industrialisation — and the generation gap that clearly exists between parents and children, a gap in values clearly exacerbated by the fact that mum and dad are simply and literally never at homes,” said one reviewer. 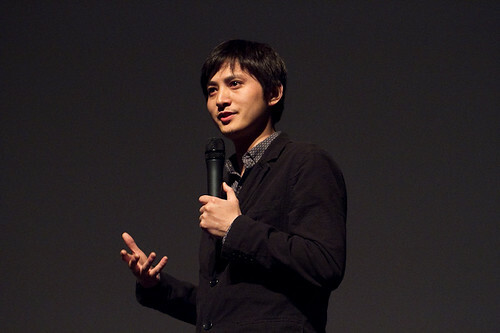 Director Fan Lixin at the ReelAsian film festival in Toronto last Fall. Fan Lixin, who now lives in Montreal, Canada, will show the 87-minute film and then take questions from the floor. Before moving to Canada, Fan was a producer and journalist at China’s state broadcaster CCTV. He is in Hong Kong for the Asian premier of this documentary at the Hong Kong International Film Festival. However, please note that this screening is not part of the festival; it is strictly educational and open only to staff and students.